When you’re tethering in a studio or on location there are plenty of places you could put your laptop…the floor, an apple box, or card table. The Tether Table Aero provides a secure platform for your laptop and a wide variety of accessory options to customize your workstation to fit your unique needs. 1. Collaboration. On a photo shoot, it often takes a team of creative collaborators to bring an image to life. As a photographer, you’ve likely seen firsthand how working with other talented artists can bring your work to a new level. On the day of the shoot everyone is working together to bring this concept to life, and each person needs to see how their part of the equation is contributing to the whole. 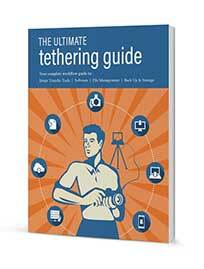 Tethering is essential to maximize creative collaborations. If your workstation is in a clumsy place where it’s not easily seen by you and your team then collaboration can’t easily take place. 2. Professionalism. There is a certain aura of professionalism that comes with shooting tethered. 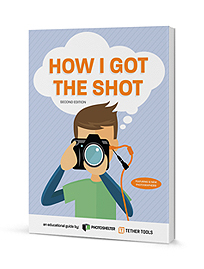 You’re respecting your client’s time, you’re producing a higher quality of images, and the end result is a satisfied customer. But, if your laptop is laying on the ground, or teetering on a nearby stool you may not be projecting the professional image that you want and hindering your own workflow in the process. 3. Mounts to gear you already have. The Tether Table Aero System allows photographers to build a workstation that works with their unique needs. Not sure how you might incorporate a Tether Table Aero into your workflow? It’s simple. 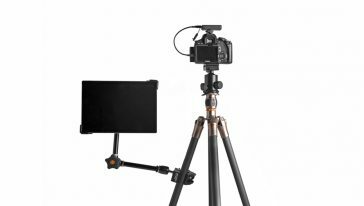 Start with any tripod, lightstand, c-stand, or arm and add a stable, lightweight, and portable Tether Table laptop platform and accessorize and customize the setup as you see fit. The Aero Series’ state-of-the-art design and functionality offers integrated mounting onto any 1/4″-20 tripod head, 3/8″ tripod mount, 5/8″ stud studio stand or Arca-style mounting attachment. The Tether Table Aero Standard mounts to any stand, tripod or arm in just a few seconds, no adapters needed using the attached LAJO-4. 4. Accessorize to fit your workflow. A Tether Table Aero is a great start but with our accessories, you can customize your table to create a workstation that is exceptionally tailored to your individual workflow. From a cup holder to a docking station for your external hard drive, you’ll be amazed at the wide variety of accessories and add-ons available. 5. Kits crafted by the pros. Not sure where to start? No problem! 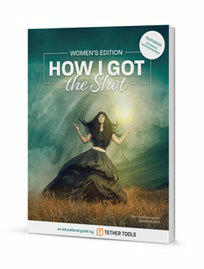 We’ve worked with some of the best photographers in the world to create the ultimate tethering kits. The Peter Hurley SHABANG! 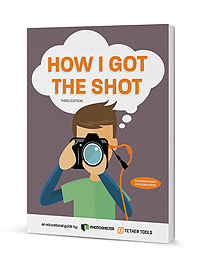 Tethering Kit includes all the same gear that Tether Tools Pro Peter Hurley uses when he’s shooting tethered capturing headshots. In addition, we worked with Tether Tools Pro and educator Scott Kelby to create the Scott Kelby Tethering Kit, all of Scott’s favorite products in one ultimate kit. Check out Scott’s kit in action in the video below.